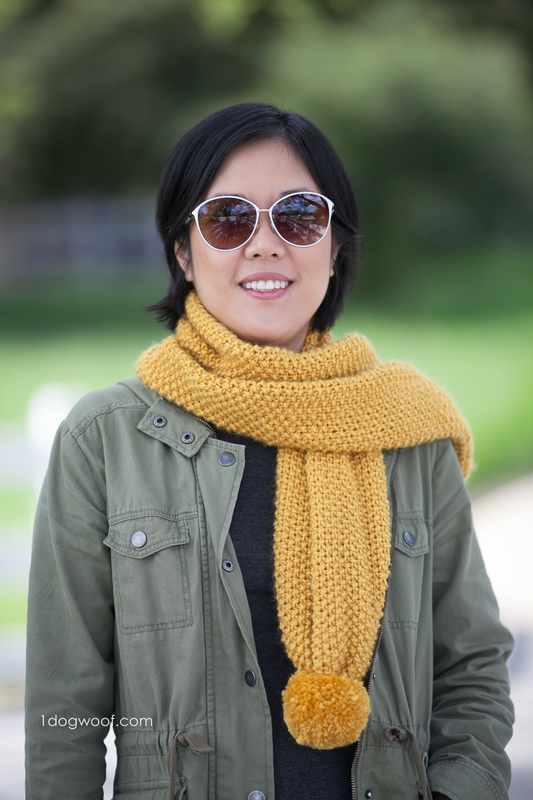 With the temperatures in the 80s this past week, this is probably the worst time to be posting about a scarf, but the Amber Waves Seed Stitch Scarf is my first seed stitch project, and I’m pretty in love with it! In love with it enough to wear it to a professional women’s conference, despite feeling a bit self-conscious about the pom-poms. Still, I figured if I’m going to meet people at a conference, then they can know there’s a fun side of me who isn’t afraid to sport a few pom-poms! As usual, I have a hard time with names, but I sort of randomly thought about those songs we used to sing in school about America. I had just purchased Former President Obama’s book, Of Thee I Sing*, and little snippets of different songs kept popping into my head. Yes, I get them confused. 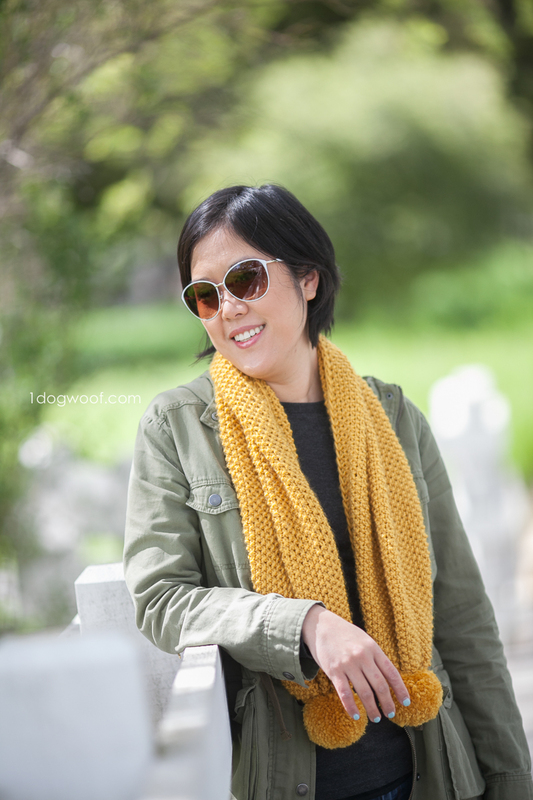 Anyways, this scarf is a mustard color and a ray of sunshine for me, and it’s made from seed stitch, which led to ‘grain’ and humming America the Beautiful, which led to the name ‘Amber Waves Seed Stitch Scarf’. Yeah, I guess I’m a weird one when it comes to playing word association games! 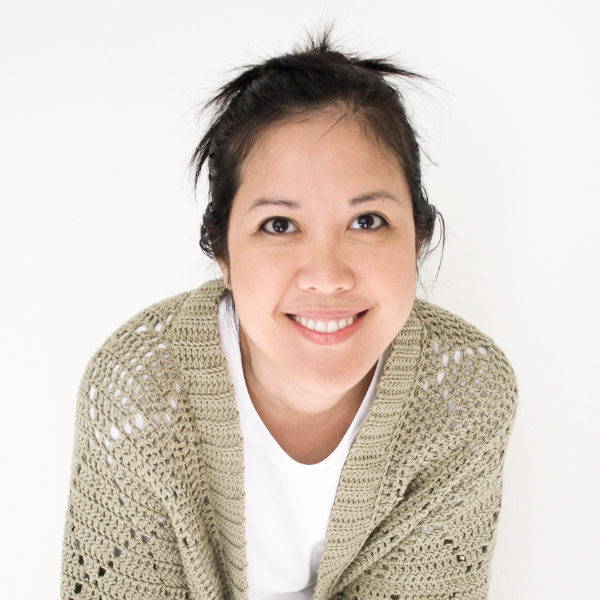 This scarf is made using 3 balls of We Are Knitters MeriWool, which they sent me to sample. 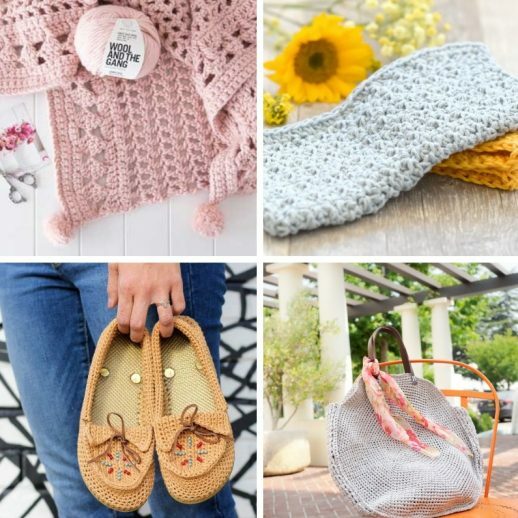 I’ve now made projects using their Pima Cotton (Summer Diamonds Kimono), Petite Wool (Buttercream Sweater), Fabric Yarn (Sirius Star Pillow) and now their MeriWool, and I really really love all of their yarn. This yarn is pretty thin, as opposed to the chunky yarns I’ve spent the winter playing with, so with a beginner knitter like me, the seed stitch takes a lot of time to work through. But boy, is it worth it. 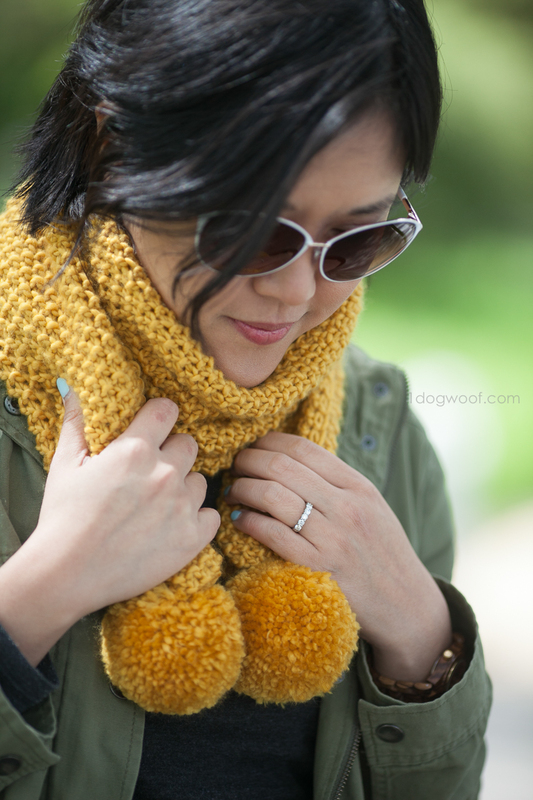 The great thing about this seed stitch scarf is you don’t need to have a specific pattern. You can just take up a ball of yarn, cast on an arbitrary number of stitches to your needle and get going right away. 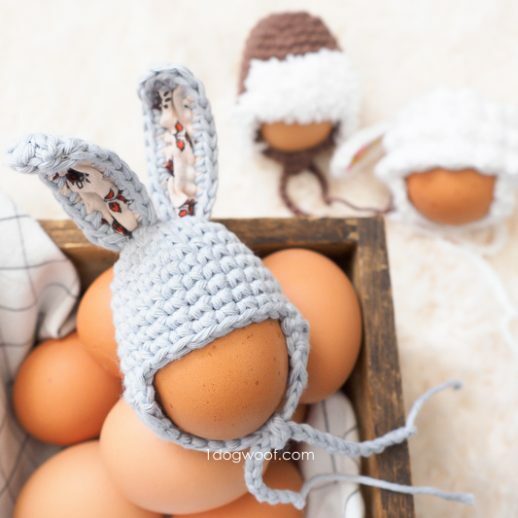 At some point in the middle, take a break, grab a new ball of yarn and make your pom-poms. Once those are done, you know exactly how much yarn you have left to play with and it’s just straight seed stitch all the way through. It’s a great tv/movie project! For my pom-poms, I use my Clover Large Pom-Pom Maker*. I usually overstuff my pom-poms, but I felt almost a little wasteful throwing so much of this gorgeous yarn into a pom-pom so I made it a little looser than usual. The fluffiness of the yarn makes any looseness undetectable. I probably used about half of 1 ball to make both pom-poms. The rest of the my 3 sample balls went into the seed stitch body of the scarf. Attaching the pom-poms was a bit of an adventure. With this yarn, you can’t pull it. It’s not a twisted yarn, so it can’t handle a lot of pressure. Pull too hard and the yarn comes apart. You’ll want to secure your pom-poms with another type of yarn, or with common kitchen string*, which is what I used. 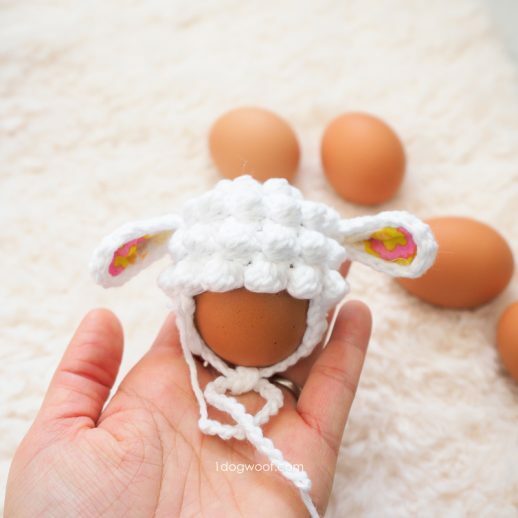 Attach the pom-pom, pull the string ends tight, tie a knot and weave in those ends. It took a bit of fudging and was definitely not an exact science, but it works! 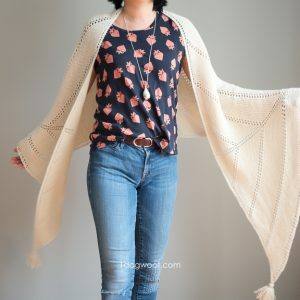 This is the perfect project to sort of free knit, but if need to follow a pattern, just scroll down! I’ve done my best with stitch counts and rows, but please forgive any discrepancy and margin in my gauge, as I’m still working on my knitting tension! And as with the Catalunya Colorblock Poncho, these gorgeous photos are credited to my friend Meghan, the super talented photographer behind Jeune Girl Photography. She also makes projects from my patterns, like the Rainbow Cuddles Unicorn, so if you’re looking for a finished project, go check out her Etsy store! Overall size is approximately 48″ long by 15″ wide. Gauge is approximately 12 stitches and 21 rows in a 4″ square. The first stitch of the row is always slipped off from the left needle to the right needle. This counts as a k1. Since there are 50 stitches across (an even number), each row will end on a purl stitch. When you turn the work, you’ll again slip the first stitch, and then purl into the 2nd stitch, which was the last k1 of the previous row. The seed stitch is created by purling into knit stitches, and knitting into purl stitches. Having an even number of stitches in each row guarantees that every row is worked identically, which makes it super easy! Number of rows listed below is an approximation. Your mileage will can vary depending on how full your pom-poms are! Row 1: Cast on 50 stitches. Row 2: Slip the first stitch. P1, k1 across. Turn. Rows 3-104: Repeat Row 2. Create pom-poms using the Clover Large Pom-Pom Maker, or the method of your choice. Tie off the pom-poms with sturdy kitchen string or strong twisted yarn, and leave a long tail (~12 inches). 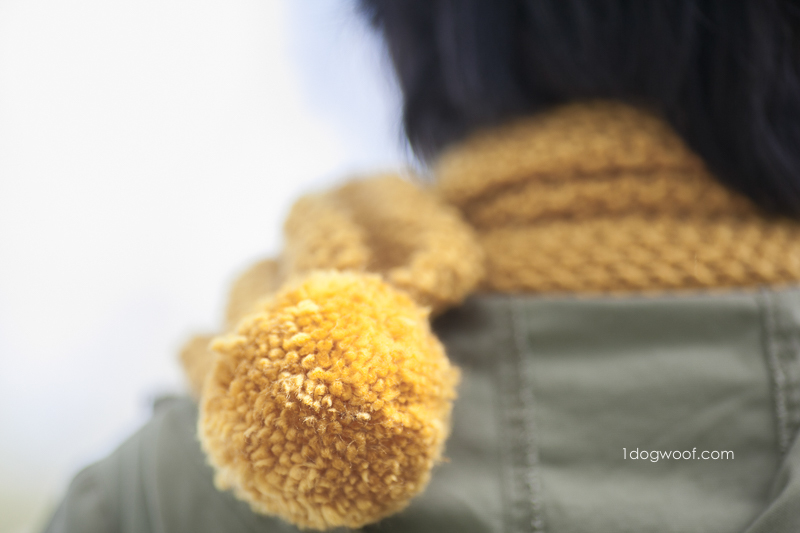 Place the pom-pom at the center of one of the ends of the scarf. Sew the kitchen string tails of the pom-pom from the center to the outside edge of the scarf. Take both ends and tie together securely, pulling the end of the scarf together. I seem to have lost the photos I took of this process, so here’s a drawing that I hope will help illustrate what to do. You want to scrunch the scarf together so that it ends in this pom-pom ball. 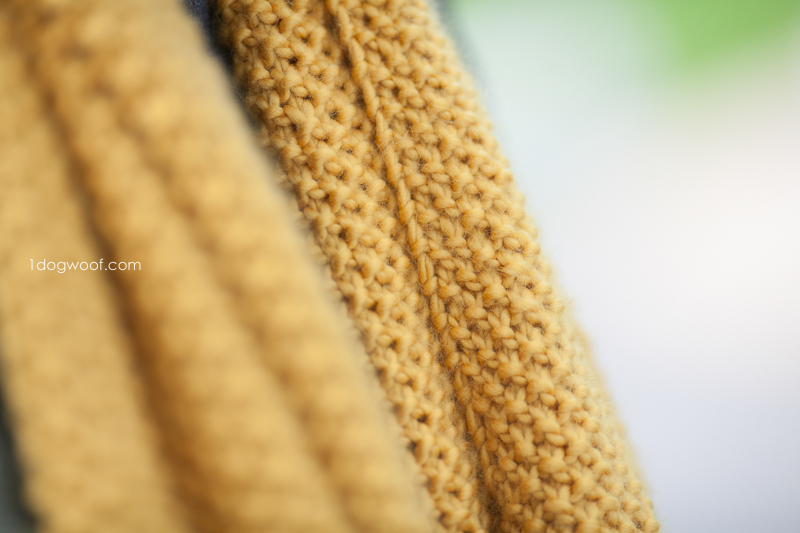 Once the ends are securely tied, weave them into the scrunched up part of the scarf. It’s can get a little messy and tight in there, but the fuzzy part of the pom-pom hides a lot! 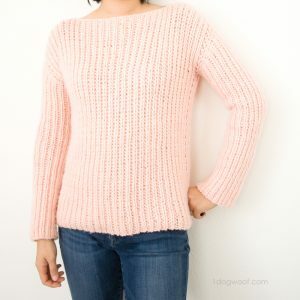 I’ve only recently started knitting, and the seed stitch is one of the stitches I really wanted to make a project with. I just love the modern texture of it! What’s your favorite knitting stitch? Please share your projects with me on Facebook (One Dog Woof) or Instagram (@1dogwoof)! Remember to tag your post with #1dogwoof!